A long-term (1+ year), annually renewable, comprehensive worldwide medical insurance program for missionaries. Being a global citizen can be an exciting experience, but it also comes with potential complications. Your health care while traveling should not be one of those concerns. 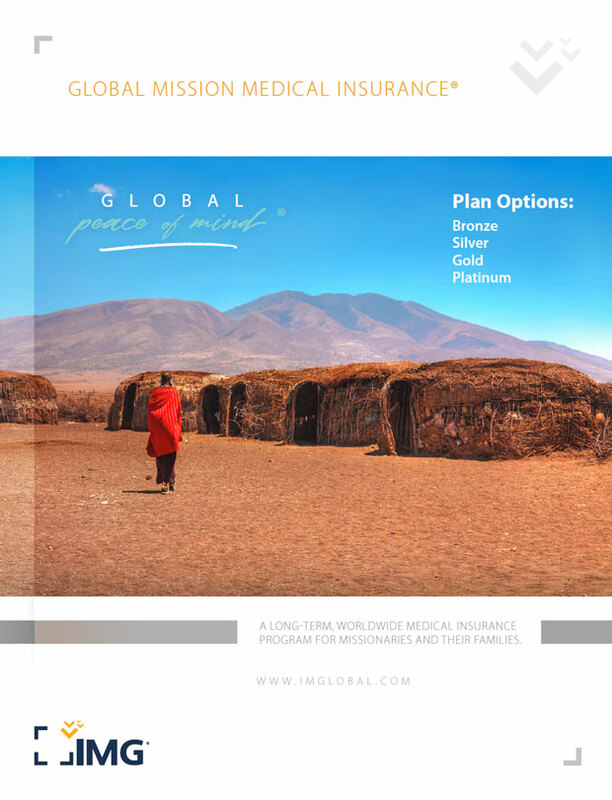 With Global Mission Medical Insurance, a revolutionary program from International Medical Group® (IMG®), you will receive the worldwide medical coverage you need, backed by the world-class services you expect. Global Mission Medical Insurance allows you to choose from several plan options, customize your length and area of coverage and select from multiple deductibles and modes of payment. With your medical history in mind, the program provides different underwriting methods to extend medical coverage to you that may be declined by other companies. Global Mission Medical Insurance comes with access to MyIMG Travel Intelligence, a suite of mobile-friendly tools and location-specific alerts designed to keep you informed of threats like severe weather, travel delays and advisories, security risks and more with trip and location-specific alerts. This plan is available to individuals and families of all nationalities. U.S. citizens must plan to be residing outside U.S. on or before their effective date and renewal dates, for at least six (6) out of the next 12 months. Additional eligibility restrictions apply to non-U.S. citizens residing in the U.S. Persons from the ages of 14 days to 74 years old may apply for coverage, and coverage ends at age 75. Persons 75 years of age and older are not eligible for coverage. Please see a sample contract for further details. To ensure your satisfaction, once you are accepted in the plan, we provide a 15-day free look period to review the coverage. If during that 15-day period you find that you are not satisfied with the plan for any reason, you may submit a written request for cancellation and full refund of your premium received by IMG. See the Certificate Wording for full details.